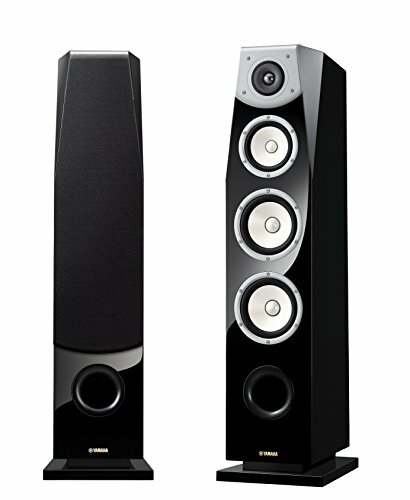 The nas-f901 offers beautifully designed speakers with an elegant piano finish. Capable of achieving transparent sound from data-rich, high resolution sound sources with excellent response, the nas-f901 speaker delivers musical excitement with outstanding expressiveness. With an elegant piano finish, the NS-F901PN speaker is capable of achieving transparent sound from high-resolution sources and achieving excellent transient response that delivers musical excitement. Soavo speakers are created by Yamaha based on our long history and rich experience, including over 125 years of making musical instruments and more than half a century of making speakers. 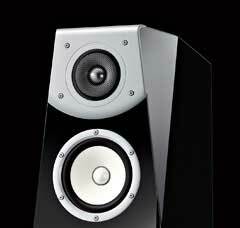 In order to reproduce new high resolution sound sources with the highest quality, the NS-901 Series features new speaker units that have undergone extensive sound quality tuning to further refine their expressive capabilities. 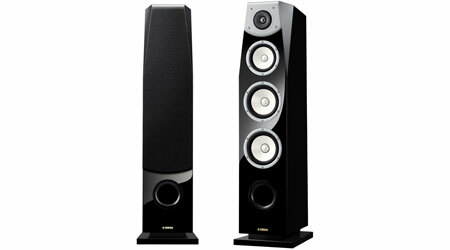 You can be sure these speakers will deliver all the aural excitement that music and movies have to offer. 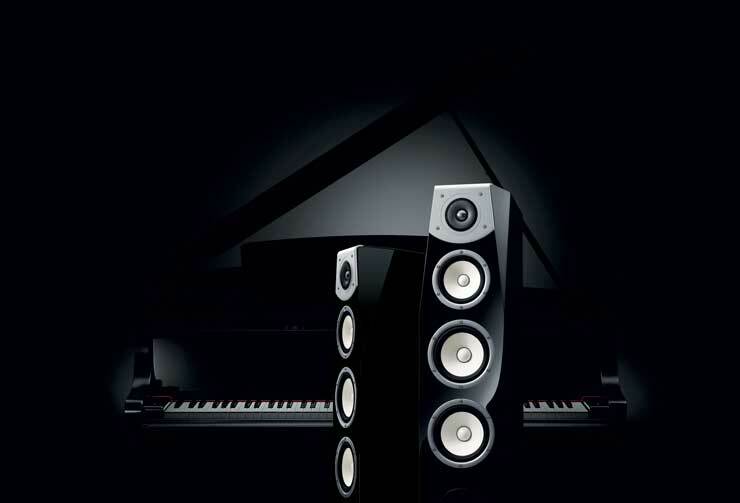 The NS-901 Series adopts Yamaha’s unique new A-PMD (advanced polymer-injected mica diaphragm) with improved cone paper in order to reproduce high resolution sound sources. Taking advantage of the strong points of the A-PMD—extreme lightness, rigidity and stability—the speaker achieves smoothness, very fast response and sound with good dissemination, reproducing information-rich sound sources with an impressive feeling of density. The A-PMD incorporates a powerful magnetic circuit with a large neodymium magnet and a highly stiff aluminum diecast frame that increases the aperture ratio, achieving outstanding power handling and responsiveness in the mid frequency range – the heart of the music. The rubber surround, a spider made by Kurt Müller of Germany and meticulous tuning also contribute to the reproduction of high quality music and movie sound. 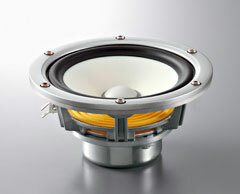 The bass unit also adopts the new A-PMD with a paper cone upgraded for the reproduction of high resolution sound. 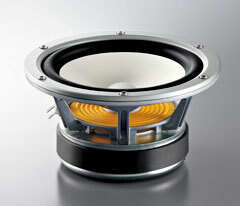 The use of a large ferrite non-shielded magnet ensures high drive power that provides prodigious bass volume. By utilizing high quality parts such as a high rigidity aluminum diecast frame that dampens resonance, it reproduces bass with a deep sense of scale, achieving both power and speed, leaking out of the speaker cone. This means the full power of the waves is forced out through the air port, resulting in clear, powerful bass. The 1″ dome tweeter is made of aluminum for both hardness and responsiveness and like the midrange unit, uses a neodymium magnet. 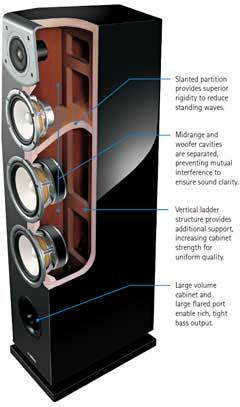 It delivers sound that links the medium and high ranges with natural smoothness and transparency. Firmly integrating the diaphragm and voice coil and using a thick surround material increases the sound density and resolution in the high range. With a heavy aluminum diecast tweeter plate that minimizes unwanted resonances and an extremely fine mesh grill that provides ideal sound dissemination, it faithfully reproduces dense sound atmospheres and nuances from high resolution sound sources. 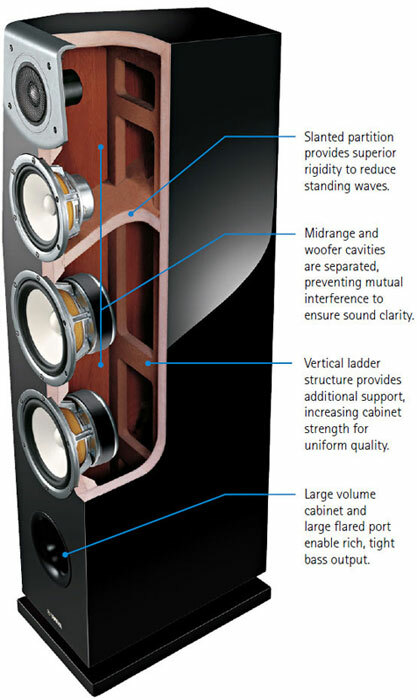 The design of the cabinet is of course extremely important if the aim is to create a speaker with superior reproduction capabilities. 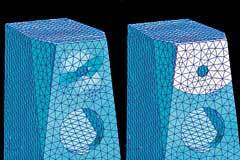 The goal was to reduce standing waves to ensure highest accuracy, as well as to provide a full, three-dimensional sound with an awesome feeling of depth. The solution was to design a cabinet with non-parallel surfaces, having the woofer and midrange sections divided by a slanted partition, and strengthening the entire enclosure with vertical ladder bracing. Another important point is the 3-way mitered construction of the cabinet joints, achieved thanks to Yamaha’s excellence in woodworking. This technique ensures extremely tight joints so the entire cabinet behaves as a single unit, providing tight, powerful and accurate bass reproduction. The wooden port is carved from high quality wood and has thick walls and a flared shape for smooth sound flow, low port noise and a spacious and massive bass feel. 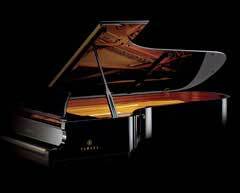 The original and beautiful form with no flat surfaces was designed by Toshiyuki Kita, an internationally famous product designer. In addition to its high sound quality due to minimal standing waves, the elegant presence of the speaker displays expressions which vary according to the viewing angle. Shaping the stand as a trapezoid without flat surfaces to match the cabinet provides a well-integrated design that looks fine in any location. The real wood veneer with luxurious piano finish presents an elegant appearance for any home theater.